Hi there! I hope you had a Merry Christmas! I’ve done all my sale shopping, so I went to Poundland yesterday. 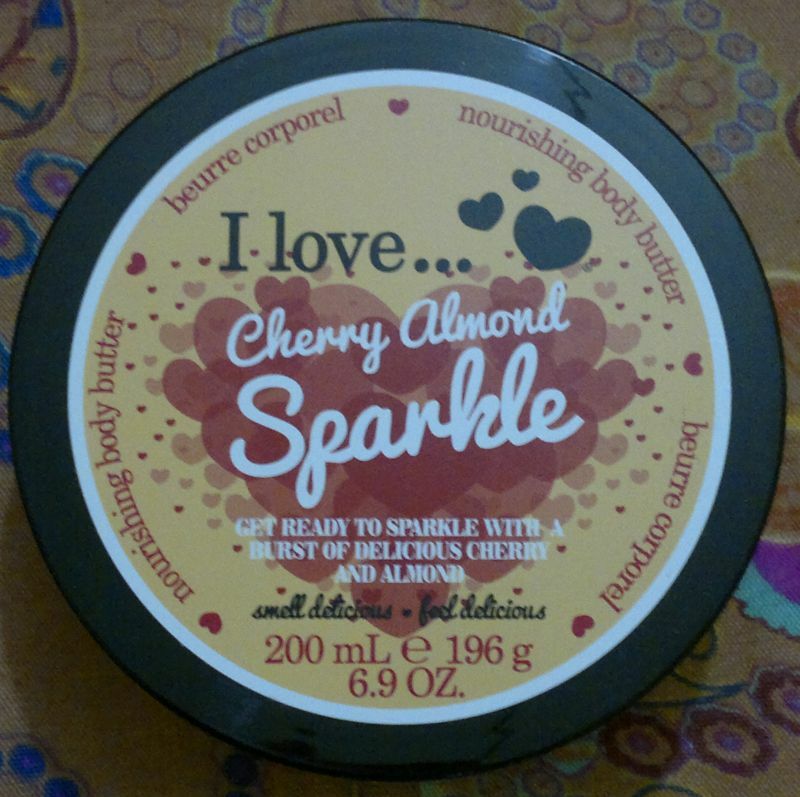 And I found this I Love… Cherry Almond Sparkle Body Butter – for £1! I just started to use the Cherry Almond Sparkle body wash a few days ago. So I was very happy to find the matching body butter for such a bargain price. I think this body butter is a really nice moisturiser. It makes my skin feel soft and it’s not sticky. And just like the shower gel this body butter smells like cherry bakewell tarts. It’s absolutely delicious and very suitable for this time of year. What’s not to love? Hi there! I’ve done a few christmassy manis this month, but so far this is my favourite mani. I was quite impressed with Beauty UK’s White nail polish – which is fully opaque in two coats. So I used it for this mani as well. 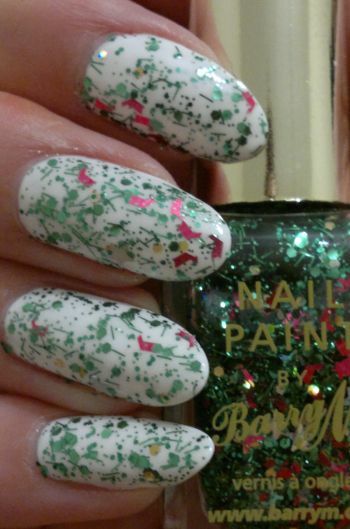 The cute topper I used is Barry M’s Christmas Tree – a limited edition from last year. This topper is packed with green micro, bar and hex glitter, red glitter flakes, golden holo hex glitter and silver holo stars. As the glitter felt very rough, I applied a thick layer of top coat. Result? Problem solved! Hi there! I hope no one has to buy any emergency Christmas presents. 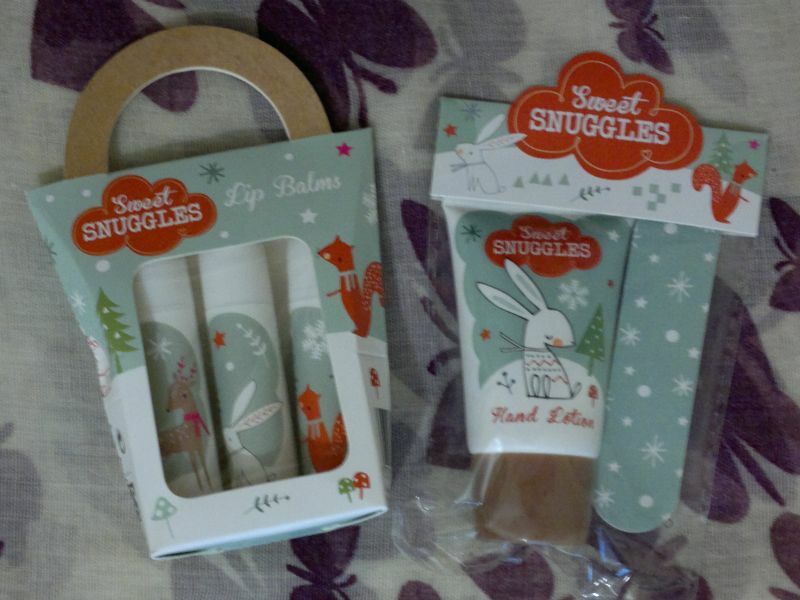 But if you have to, and if you’re near a Superdrug store anyway, check out these Sweet Snuggles Lip Balms and Hands & Nails sets. I think these sets are super cute – almost kawaii. The three lip balms feature images of a reindeer, a bunny and a fox. The hand cream also features a cute bunny image, and the nail file looks wintry as well. The products are BUAV-approved, and they carry the Leaping Bunny logo. This means the products are cruelty-free! The best thing is these sets are £1 each! Hi there! I spotted these cute Maybelline Color Sensational Luscious Lipglosses at Poundland the other day. I’m not very much into Maybelline, and their Popsticks left me pretty much underwhelmed. But I thought these glosses looked promising. I’ve tried them both now. So it’s time I put my thoughts into words. 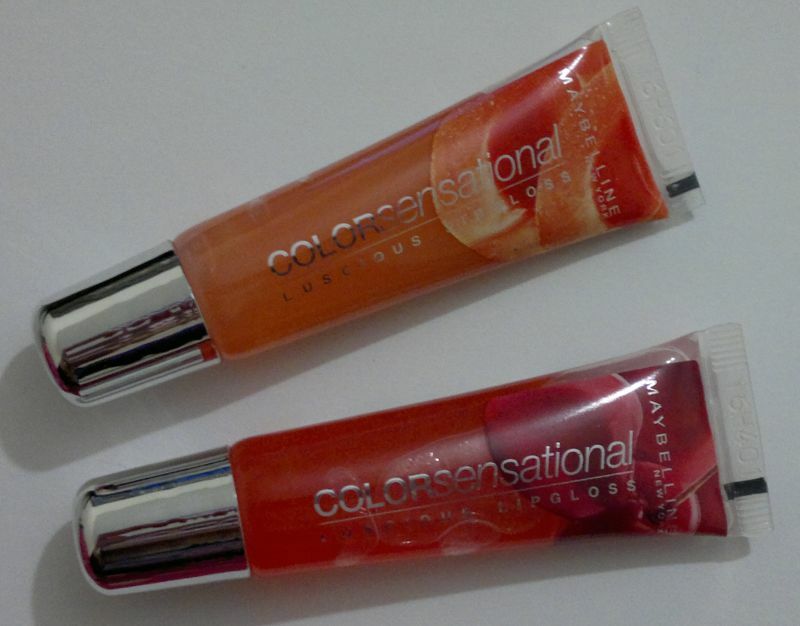 Maybelline Color Sensational Luscious Lipgloss 410 Peach Sorbet has a peachy tint which is invisible on the lips. I’m OK with that because I don’t care for peachy, orange or coral lips. Maybelline Color Sensational Luscious Lipgloss 520 Cherry Kiss looks tinted in the tube as well. But the soft cherry tint doesn’t show on the lips at all. I’m OK with that too because I’m not a red lips gal at all. I have to mention that I find the cherry flavour a bit too sweet for my taste, and I think the glosses are quite sticky (certainly above average sticky). But overall I really like them and I’ll use them up for sure. I believe these Maybelline Color Sensational Luscious Lipglosses have been discontinued. However, they can still be found online or in discount stores like Poundland, etc. Hi there! I’m one of those people who buy beauty gift sets for themselves – usually post-Christmas when they’re half price. 😉 Now imagine how happy I was when I spotted a few different I Love… gift sets for half price at Superdrug’s last week. Most of the sets contained familiar I Love… products and fragrances, such as Strawberries & Cream, Mango & Papaya and the likes. But I found one set which contained Raspberry & Blackberry products AND this limited edition I Love… Cherry Almond Sparkle Bath & Shower Crème. I’ve used this shower crème twice now, and I must say that I love it. It smells just like cherry bakewell tarts. Absolutely delicious! I can see that I might eventually tire of this fragrance, but for now I’m very happy with this yummy shower crème. I also like that this product is very gentle. I don’t think it’s particularly rich or creamy or moisturising, but it’s not drying at all which is always a bonus, especially if you have dry or sensitive skin. I Love… Cherry Almond Sparkle is available as 250ml and 500ml Bath & Shower Crème, 200ml Body Butter and 100ml Body Spritzer. I don’t know how much the 250 ml Bath & Shower Crème is, but the other three products are £2.99 each. Hi there! Christmas is just a few days away, so I’ve done another festive mani the other day. 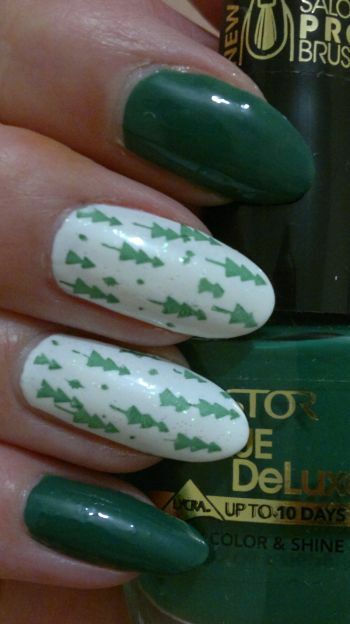 I really liked Astor’s Lacque Deluxe 880 Forest Green when I used it for my last christmas mani. This time I teamed up the pretty green polish with Beauty UK’s White (2 coats) and a no-name iridescent white shimmer polish (1 one coat) which did a great job a few weeks ago. I found this tree image on Pueen’s 42 plate (Love Elements set). I thought it’s really perfect for this christmas-themed mani. The trees are a bit funny. This is because the image was quite small, and I had to improvise. My nails have also grown quite long, and my stamper no longer covers the entire nail… I think I need a bigger stamper! Hi there! I’m taking part in this year’s Secret Santa at my workplace. And I was lucky to draw the name of a female colleague out of a mug. 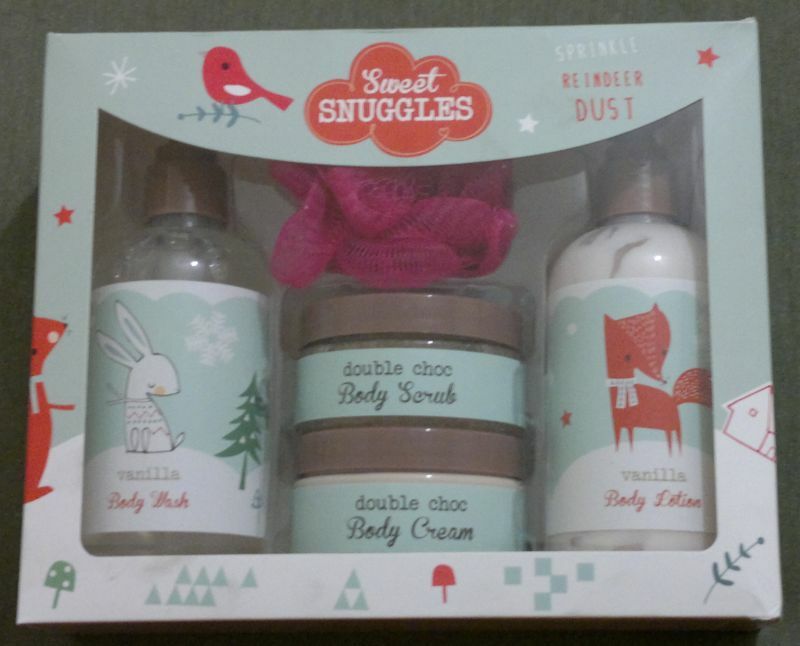 I knew I’d be going for a toiletries set anyway, so I bought this Sweet Snuggles 5 Piece Bathing Set. This gift set contains 250 ml Vanilla Body Wash, 250 ml Vanilla Body Lotion, 100ml Double Choc Body Cream, 100ml Double Choc Body Scrub, and a pink body puff. This Sweet Snuggles 5 Piece Bathing Set is £4.50 only at the moment. I think this is a really good deal considering the set contains full size products. So if you’re looking for a last minute Secret Santa gift for a female colleague, I think this gift set (which is available at Superdrug’s) would be a good idea. Another plus: This set carries the Leaping Bunny logo. The products are cruelty-free and suitable for vegans!